One of the rites of passage of childhood in many cities is the beloved ice cream truck! In many neighbourhoods and city parks, kids come running when they hear an ice cream truck’s familiar tunes. 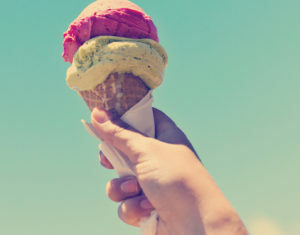 The ice cream truck is an inevitable part of summer, but there’s also a careful sales strategy behind it—and other business owners can learn from it. It sounds simple, but it works: Ice cream trucks find customers by going to their customers. Whether that’s driving through neighbourhoods full of kids playing outside, or driving up to crowded city parks where people might want to enjoy a refreshing treat, ice cream trucks go to where the customers are. In your business, selling directly isn’t always obvious. Selling ice cream to kids is simpler than selling complex B2B solutions to business buyers. But you need to make sure your sales strategy is working hand in hand with your marketing strategy to find and target the right customers in the right places. Ice cream trucks are known for playing catchy jingles from their loud speakers to get people’s attention and to interrupt the usual routine. Even other food trucks that don’t sell ice cream have gotten more inventive about painting their trucks with bold colors and offering unique food creations. What can your business do differently to be memorable and cut through the clutter? Ice cream trucks are one of the original “food trucks,” and food trucks have become a big business in every major American city, selling everything from tacos to Belgian fries to seafood. Food trucks have become more sophisticated using mobile marketing, and this type of marketing is relevant to all businesses today. Food trucks in big cities are on Instagram and Twitter, sharing photos of their food, offering daily specials to social media followers, and otherwise looking for ways to sell products in a way that is enhanced by the mobile food truck experience. In the same way, even B2B sales organizations need to get better at using mobile marketing. More of your B2B buyers are using mobile devices to do product research and price comparisons. Is your B2B marketing speaking to a mobile-savvy audience, or are you still stuck in the desktop era? Many people have fond childhood memories of enjoying frozen treats from an ice cream truck. There’s something about the experience of eating ice cream outside, delivered from a truck, that provides a one-of-a-kind feeling of comfort and convenience. It’s one of those “taste of summer” experiences that stays with you forever. What can your business do to create a similar powerful emotional experience for your buyers? Ultimately, people usually don’t make buying decisions based on rational, logical, numbers-driven reasons—they buy for emotional reasons. What can your business do to make people feel better? Even if you’re a B2B seller of “technical” solutions, focus on the emotional connection. Can your solution help relieve your buyers’ stress, boost their optimism for future growth, or eliminate daily organizational clutter and tension? Don’t be afraid to sell the emotional side of your product or service; it might be what people respond to best of all. Summer is often a time of nostalgia, fun, and relaxation. The beloved ice cream truck is one symbol of this softer, easier time of year, don’t assume that it’s just an innocent bit of fun—it actually shows some great examples of how to be more successful in sales.